Girls has been groundbreaking since the beginning and Season 5 is no different. Home Box Office has continually been synonymous with outstanding televisions series almost from the time they started producing them, and they show no signs of slowing down now. Case in point, the series Girls, about to start it's sixth season in February, has been nominated and won numerous awards over the past 5 years. The Lena Dunham (This is 40) created series chronicles the trials of a group of 20-somethings in New York City. Before Season 6 begins, HBO Home Entertainment has just released Season 5 on Blu-ray. As Season 5 begins we catch up on Marnie (Allison Williams; Peter Pan Live!) and Desi's (Ebon Moss- Bachrach; The Lake House) relationship as the group prepares for their wedding. The on again/off again couple is finally walking down the aisle… or are they? We also get to see the awkwardness between Hannah (Dunham) and Adam (Adam Driver; Star Wars: The Force Awakens) and Adam's blossoming attraction to Hannah's friend Jessa (Jemima Kirke; Tiny Furniture). Girls has been groundbreaking since the beginning and Season 5 is no different. Dunham and the other writers do a phenomenal job of address today's tough issues regarding sexuality and gender and the show is definitely a champion for the LGBT community. It makes you question everything you know and feel about LGBT individuals and is not for the faint of heart (cue the mutual masturbation scene in Episode two). It also isn't for those with more conservative views. However, underneath it all, Girls is mainly about people and their relationships and this cast does a beautiful job of taking us along on their journey. Dunham leads a group of talented, young actors who mesh well and make these relationships believable. Aiding them are the terrific scripts and dialog. Dunham and the rest of the writing team give them so much to work with that it's hard not to shine. The writing is sharp, intelligent and leaves you begging for more. The first episode went by so fast I felt as if I had only been watching for 10 minutes. The Blu-ray combo pack includes the Blu-ray, DVD and Digital download. The video is presented in 1080p High Definition with a 1.78:1 aspect ratio, which makes the quality excellent. The picture is crystal clear and images and colors are sharp. The DTS-HD Master audio 5.1 is crisp, which complements not only the dialog but the eclectic soundtrack as well. The Blu-ray includes two extras: Deleted and Extended scenes and Inside the Episodes, neither of which add all that much, but the latter being more interesting than the former. 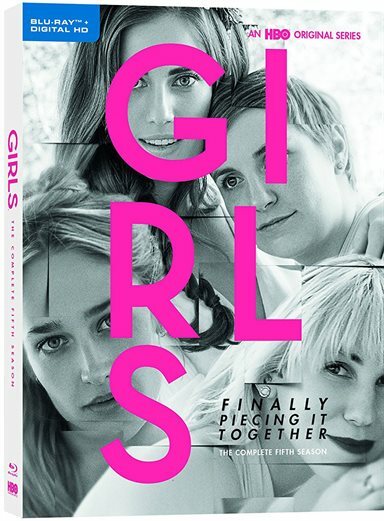 Girls is quality television at its best, if more than a bit raunchy and raucous (but that's part of what makes it so great), and HBO was smart to create it and keep it in the loop for 5 seasons. With more to come, you would be dumb not to rewatch the great moments of Season 5. I highly recommend buying this combo pack as well as getting Seasons 1-4 too. Download Girls: The Complete Fifth Season from the iTunes Store in Digial HD.